The level of corruption, immorality, heresy, and greed present in the World Orthodox patriarchates is astounding. The fact that the Romanian Patriarchate, would welcome about 500 million dollars to build a new gigantic church amidst a poverty stricken land, hit hard in the economic crisis is just horrific icing on top of the cake. I suppose a 100 million dollar church would have been less than sufficient to appease the ecumenist Patriarchate; they must have a 500 million dollar church. It will cost approximately half a billion dollars. It is one thing for this to happen during good economic times, but, how will this money be spent? Well, since it is government funded, I can almost guarantee, like most government bids, involving contractors, etc, there will be a large amount of fraud, over-spending, delays, and other issues. Yet, the Romanian Patriarchate, like the Serbian and Bulgarian, have all the resources in the world to live in luxury palaces, drive expensive imported cars, hold prayer and joint liturgical services with non-Orthodox groups. Corruption has always been with us, but, in times of great heresy and decadence, and especially when the heretics are in control, we see things really ramp up. During these times, when the Orthodox are in the minority, powerless, persecuted and attacked, we see the realization of the Orthodox attitude; lack of the world’s support, thus we must trust only in God, and not in princes and the sons of men. Indeed. A “National Cathedral of Redemption”? 500 million dollars you say? Government donation of land you say? 200 million euros of land you say? That sounds like some pretty expensive and prized land. I wonder how all the poor Romanian peasants and farmers, who must be struggling to pay their property taxes could be aided by this new construction? Perhaps they must resign themselves and support massive amounts of their money going to support those who live in luxury. Will the poor peasant farmers and other small land owners be given special treatment? Now, I’m not advocating for taxes to be placed on religious and charitable institutions, but, I’m looking at this from the angle of those who aren’t on the inside. Will the Romanian Patriarchate lend itself to a crusade to have people who own 11 hectares or less to be exempt from taxes on their property? Have they? An hectare is about 2.5 acres of land. It is attitudes like this, and events like this, that were used by the hands of communists to attack Christianity, and to paint it to be the religion advocating only for privileges of the few; the average peasant farmer only wanted his little plot of land left alone for him to farm on, yet, how could he not feel scandalized in seeing what was done elsewhere, especially by those he thought to trust? Do we have more? Sadly, yes. “Construction started in 2010 and sparked controversy in impoverished Romania, a country where thousands of people took to the streets at the beginning of the year to protest against the government’s austerity measures, lack of jobs and poor living standards. It is also the country where last year half of the hospitals were closed or merged leaving thousands of people, especially from the countryside, without a hospital nearby. 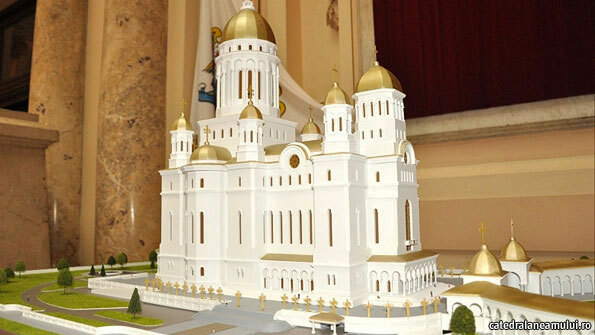 The cathedral, built right next to Nicolae Ceausescu’s Palace of the People, will be 125 metres high and could become the tallest Orthodox church in the world. With space for up to 5,000 people at a time, it is meant to symbolise Romania’s spiritual unity and national dignity. Faced with public pressure, the heads of the Church denied the initial cost estimate and said the construction would amount to just €100m. They said the money would be raised from donations but the actual fund-raising process remains a mystery. So far, the government and some of the city halls in Bucharest have donated more than €10m to the project from the public purse but the Church keeps asking for more money every once in a while, local officials said. Some politicians are very eager to help. The National Agency Against Corruption revealed a phone conversation between Patriarch Daniel, the head of the Romanian Orthodox Church, and Viorel Hrebenciuc, a well-known Social Democrat MP. According to the transcript, the politician told the Church leader that he can help him get a loan for the construction of the cathedral from Banco Espirito Santo, the “Holy Spirit” Bank, in Portugal. The case is under investigation. So why are some politicians supporting the Church? The Orthodox Church is the most trusted institution in Romania, according to official polls. The Church claims to have around 18m followers in Romania, which counts for over 80% of the total population. The Orthodox Church has refused to offer The Economist‘s correspondent in Bucharest an explanation. Clerics avoid talking about the Church’s sources of finance and about its fortune. Yet judging by the luxurious cars the Church leaders were seen in at some public events, one might conclude that their finances are not too bad at all. So, the Patriarch of the Romanian Patriarchate was busy with loans from the “Bank of the Holy Spirit”? The donations have been coming, too slowly, apparently. Perhaps the Bucharest Patriarchate plans to do other things with the buildings? Perhaps I am being too harsh? Perhaps my own experience has altered ‘unfairly’ my of way thinking. My experience has not been one of viewing this matter from that of disinterest. Living in an area where monasteries and churches have to pay taxes on land that is generally of little development value (mountains, rocks) for the sake of some peace and quiet, and seeing the injustice that should be manifest to all men, of the poverty stricken having to pay to even live on a few acres of land, while the powerful and connected can avoid all such measures imposed on them; because of this, I am generally of one view in matters such as this. So, the world wide plan of ‘austerity’ has come to mean the closing down of hospitals, the raising of taxes, the giving of lands and money in large sums to former communist ridden institutions who’s leaders drive nice cars, while the rest of the world must be subject to a belt-tightening measures? It seems strange that those who would own dozens of palaces, should lecture the world on austerity. Yet, as I’ve stated above, it is situations like this, whereby legitimate grievances have been taken, and then culled for the interest of atheistic and evil forces. The communists did it, and all stripes of socialists, nationalists, fascists, etc. Yet, I seriously doubt any change will take place. These are large institutions of a bureaucratic nature. The Holy Ghost left some time ago; now were just dealing with mini-Vaticans at a national level. And we all know what that means.